With 16 individuals qualifying for the World Cup roster, Team USA features 10 Olympians who have combined to make 19 Olympic teams. With a deep, veteran pool of skaters we have on this fall's Sprint Team, we’re positioned well to compete at the highest levels in all distances. US Speedskating announced its 2016-17 Long Track Fall World Cup roster today following the three-day World Cup Qualifier meet held at the Pettit National Ice Center in Milwaukee Wisconsin. Skaters named to the Fall World Cup roster earned start positions for the first four ISU World Cups this fall, with specific team and distance announcements to take place prior to the respective World Cup event. The ISU World Cup season starts in Harbin, China on Nov. 11-13. A winner of 18 total World Cup medals last season and the 500m overall World Cup champion, Heather Bergsma (High Point, N.C.), earned top honors in the 500m, 1000m, 1500m and Mass Start. Qualifying alongside Bergsma on the ladies side are 2014 Olympians Kelly Gunther (Clinton Township, Mich.) and Sugar Todd (Omaha, Neb). Joining the three Olympians are 2015-16 Fall World Cup team member, Paige Schwartzburg (Ocala, Fla.) and 2013-14 World Cup member, Petra Acker (Clifton Park, N.Y.). In addition, Jerica Tandiman (Kearns, Utah) qualified for her first World Cup roster, while Mia Manganello (Crestview, Fla.) returns to the World Cup stage for the first time since 2007-08. On the men’s side, seven of the nine qualified skaters have Olympic experience, including two-time Olympic champion Shani Davis (Chicago, Ill.) and four-time Olympian KC Boutiette (Tacoma, Wash.). Their combined seven Olympic appearances will be joined by fellow Olympians Joey Mantia (Ocala, Fla.), who placed first over the weekend in the 1000m, 1500m and Mass Start, and the 500m American Record-holder Mitch Whitmore (Waukesha, Wisc.). 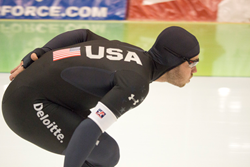 2010 Olympic silver medalist Brian Hansen (Glenview, Ill.) also qualified for the team after a two-year break while attending the University of Colorado. Others to qualify include2014 Olympians Jonathan Garcia (Houston, Texas) and Emery Lehman (Oak Park, Ill.) Kimani Griffin (Winston-Salem, N.C.) and Ian Quinn (St. Louis, Mo. ), members of the 2015-16 Fall World Cup team, round out the men’s squad. A full list of the 2016-17 Long Track Fall World Cup roster in alphabetical order is below.